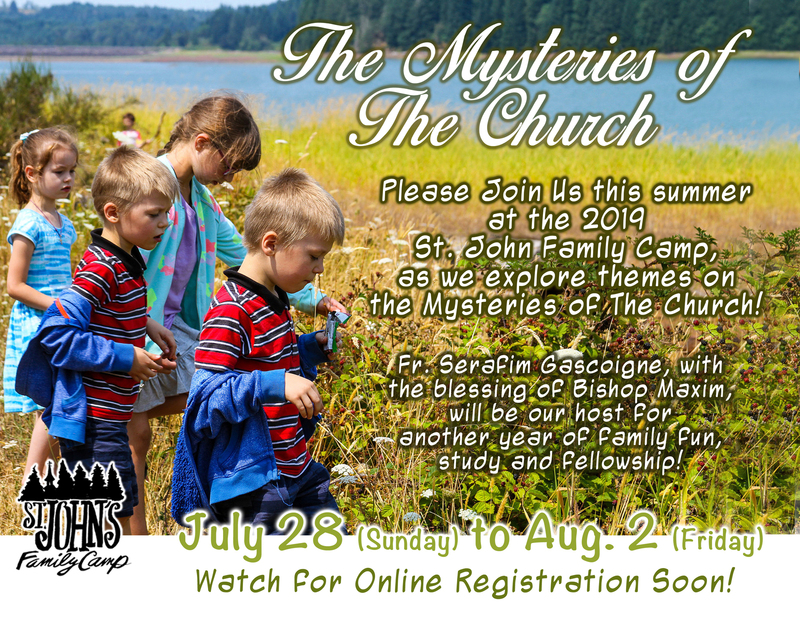 The St. John the Wonderworker Family Camp is a retreat for Orthodox Christians — families and singles — in a beautiful lakeside natural setting a half-hour from Eugene. The Camp offers unique opportunities to Orthodox Christians, especially those throughout the Northwest, for prayer and fellowship together. The campsite, a Kiwanis camp, offers cabins and full services for participants. • Daily Rates for Overnight Stays – Single: $37.50 per day, Family of 2: $72 per day, Family of 3: $102.50 per day, and Family of 4 or more: $125 per day. This year’s theme is “The Mysteries of the Church,” and we look forward to delving deeply into this topic during the scheduled talks with our presenters and facilitators: Fr. Seraphim Gascoigne, Fr. Laurent Cleenewerck, Olga Caffee, and Kennen Biornstad–who also serves as our new St. John’s Family Camp Coordinator. If you would like to volunteer for any of these positions or if you know someone who would make a good addition to our team, please contact our coordinator Kennen Biornstad kennen.stjohnsorthodoxfamcamp@gmail.com in order to receive more information and staff/volunteer application. We look forward to seeing all of you at Family Camp this year! ​Bidding you all good strength as we enter into this last week of Great Lent and on into the Passion, Crucifixion, and Holy Resurrection of our Lord and Savior Jesus Christ. May the 2019 St. John’s Family Camp be blessed! Please note: Camp runs Sunday, July 28 to Friday, August 2, 2019.
of fellowship, prayer and teaching. Each day of the five-day camp includes the Divine Services (Matins, Vespers, and Compline with a mid-week Divine Liturgy), talks for adults, creative activities for children, and both special activities and talks for young adults. Afternoons consist of family recreation time, including swimming, hiking, and playing games. Evening events include folk and line dancing and special presentations. For Christians, pilgrimage — a journey to receive blessings, either by venerating a holy place associated with the life or miracles of Jesus Christ, the relics of a saint, or holy church or monastery — is important. During pilgrimages, Christians pray, confess, and both deepen their relationship with God and their understanding of the Faith. As places of continuous prayer and spiritual sobriety where one can venerate relics and seek counsel from experienced spiritual guides, monasteries are typical places of pilgrimage. Yet, when one has a family — especially a young family — pilgrimage is often more difficult (but not impossible) to make. For this reason, the St. John the Wonderworker Family Camp was conceived as a place where families can be together in prayer, fellowship, and joy. The St. John Family Camp is a vacation that is also a pilgrimage. Part of the experience is belonging to a community that forms at Camp. For five days, we live the “village life” together, praying, eating, learning, and recreating together, but also cleaning and cooking together. Just as at a monastery where one participates in “daily obediences” (daily tasks), at the Camp, we have found that we forge deeper relationships by working alongside one another; it also keeps expenses down because Camp participants are part of the “staff.” Everyone from seven or eight-years old or older assists with three or four tasks during the week. Learn about the history of the St. John the Wonderworker Family Camp here!